For more information on the services we provide, you can view our marketing card. 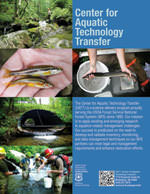 The Center for Aquatic Technology Transfer (CATT) is a science delivery program. CATT biologists and technicians are Southern Research Station (SRS) employees funded by the National Forest System (NFS). Our project partners are primarily NFS managers and resource specialists. We collaborate with SRS scientists to develop custom solutions for our project partners. The CATT was created in 1995 in response to the growing need for research technologies to be applied directly to management problems. The number of research personnel was, and still is, too small relative to the number of NFS managers to satisfy specific needs. Our goal is to provide an increased level of support to our NFS partners. Full-time CATT personnel are stationed in Blacksburg, VA. We work primarily on NFS managed lands in the Southern and Eastern Regions. We also provide support to SRS research projects on other Federal, State, and private lands. Our primary focus is on aquatics-related management challenges. Our flexible organizational structure allows us to provide whatever levels and types of services our partners request. Past projects range from providing a field technician for an afternoon of fish sampling, to Region-wide, multi-year efforts, including sampling design, personnel management, data analysis and reporting.